WEST YELLOWSTONE, Mont. 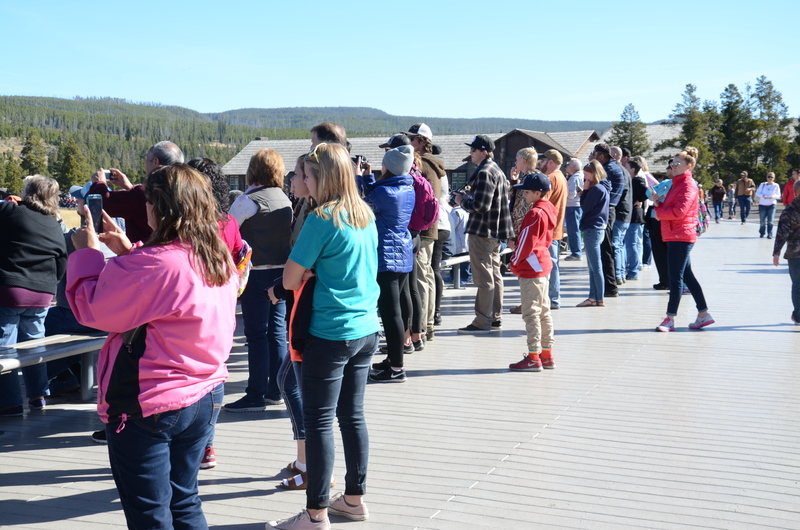 — Walking into the Old Faithful Visitor Education Center and seeing on a sign that the time marking the geyser’s next predicted eruption is five minutes away is more of a marker for a maelstrom of sprinting to occur than anything else. You will find tourists armed with Nikons, Canons and smartphones on selfie sticks dashing to capture the show, rangers working the desk absorbed in preparing to document the duration of the eruption, glass doors blurring from the cycle of being opened and closed and somehow, even if you didn’t intend to, you will find yourself sucked into the madness too – running to see the whirlpool of water and steam as they transcend their chalky surface and shoot into the sky for only a few minutes. 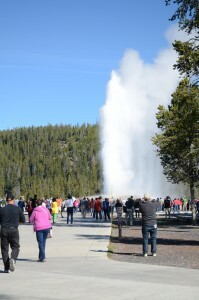 Visitors hurry to watch an eruption of Old Faithful geyser in Yellowstone National Park (Staff photos). Until, of course, the next 90 minutes – when it happens all over again. That’s been the interlude for Old Faithful geyser’s eruptions since it was discovered by explorers in 1870, growing since then to represent one of Yellowstone National Park’s most famous and sought-out attractions: an erratic show of steam and water occurring in the most stable and consistent of intervals, give or take 10 minutes. The contrast between chaos and order is one of the many factors that make the geyser so alluring, enhancing the idea that no matter how much the infrastructure of the park its in changes through the hands of man, it will stay the same by the ordinance of nature. 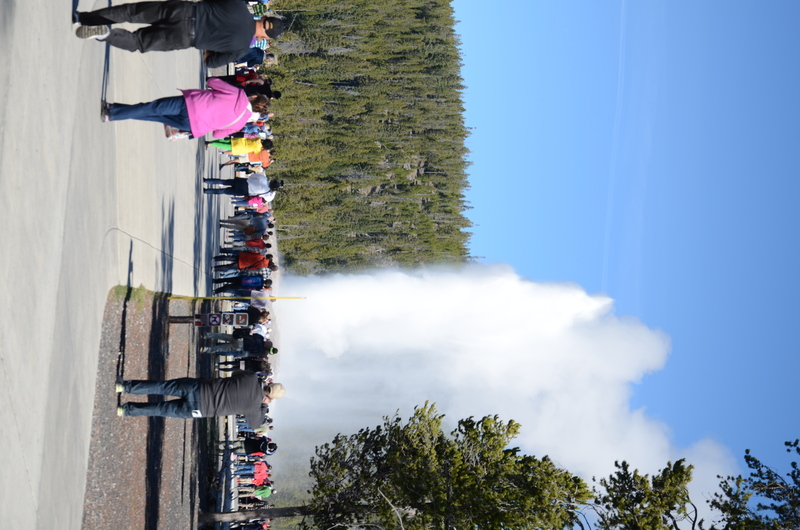 Visitors watch water and steam rise out of Old Faithful in one of its regular eruptions. 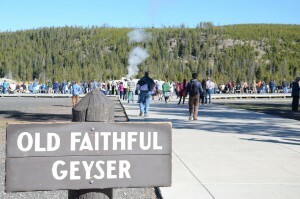 Surprisingly, Old Faithful does not hold the most density or erupt with the most frequency compared to the plenty of other geysers at Yellowstone, but its stable occurrences and the intense compilation of research done on it have fueled its popularity. The cone geyser discharges anywhere from 3,700 to 8,400 gallons of water laced with scorching steam, which falls against the ethereal backdrop of lodgepole pine trees and mountains. 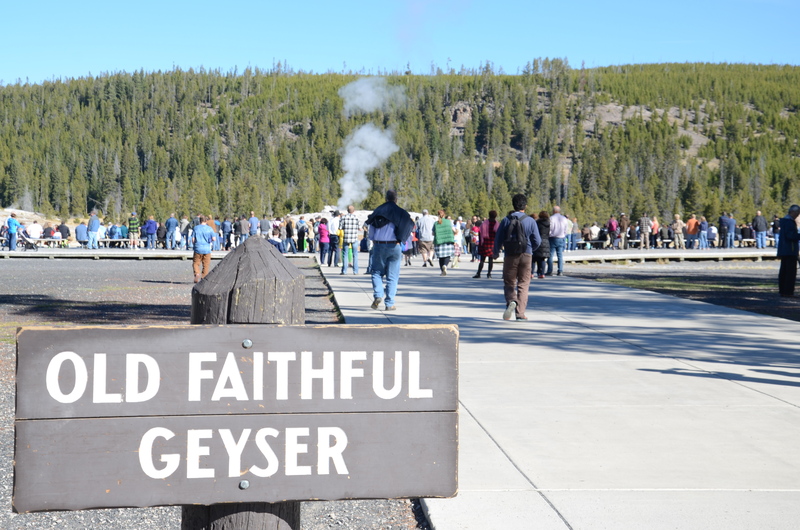 People can view the eruption from the circular array of benches perched about 300 feet from the geyser, which, if the park’s sign doesn’t tell you an eruption is soon to occur, the loyal audience’s mass most likely will. 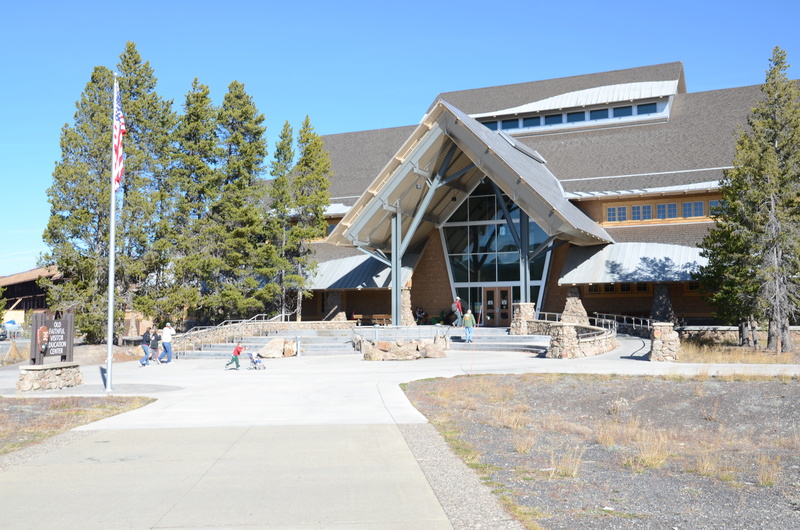 The Visitor Education Center is a must-stop location for visitors who wish to learn about Old Faithful, geysers and other geothermal features of the area. “While working here, we encounter people from all over the world. I love meeting them; it’s probably my favorite part besides the great geology here,” said Dawn, who did not want to be identified further. Dawn is a park ranger whose been working at the information desk in the visitor center for three years. She was armed with a stopwatch and a notebook during one of the geyser’s eruptions and tucked into a corner so that no one could disturb her documentation. “We measure the duration and height of the eruption and when we notice a correlation between the duration of different eruptions we make the next prediction better,” she said. The historic Old Faithful Lodge is just a few steps from the geyser site. Magma leftover from a volcano eruption and buried three to eight miles deep into the ground triggers the eruption. The water’s temperature can reach a staggering 400 degrees Fahrenheit and the fractures carved into the rocks are what allow for the water to be transmitted from below ground to the surface, which is why it’s referred to as an organic “plumbing system” by many. 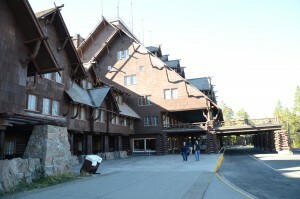 The geyser is part of the Old Faithful Historic District, which also features the Old Faithful Inn, the Old Faithful Lodge Cabins and the Old Faithful Snow Lodge & Cabins. 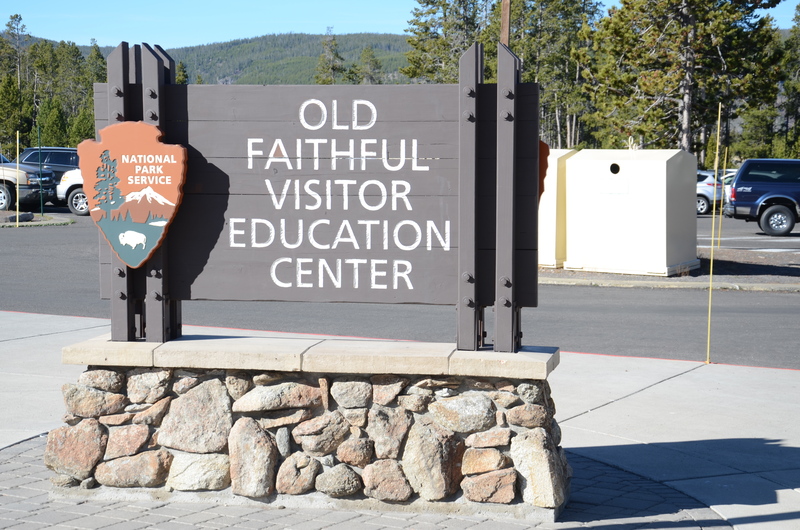 The inn has housed people since 1904, luring visitors over with its quaint, rustic architecture and direct view of Old Faithful. It offers a variety of rooms to stay in, from a suite with two queen beds at $572 to an Old House room with a shared bath for $115. The inn includes a restaurant, gift shop and snack bar, as well as daily tours of the historic site. 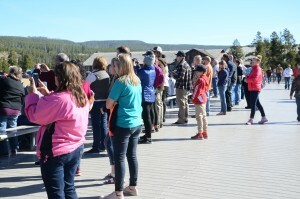 A circular boardwalk around Old Faithful affords a good view for all visitors, even during busy summer months. The lodge’s cabins also serve as the perfect reprieve from the heat during the summer. Guests can stay in frontier cabins for $146 or rustic cabins for $88, both of which are simpler than their inn counterparts, but create a much more authentic, western experience. 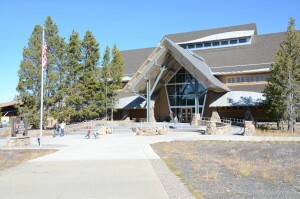 During the winter, the snow lodge opens its ice-laden doors to offer a new way to navigate through the park: snowcoaches, skis or snowshoes. Visitors can take a snowcoach tour to the Upper Geyser Basin to see the rainbow of geysers add steam to the cold or to the Canyon area to witness icy waterfalls frozen like glass splinters. Or they can warm up inside the lodge with a cup of hot chocolate by the fire – with the drop in temperatures that come during the winter that may serve as a much-needed respite. Dining for general visitors can be savored at the Old Faithful Lodge Cafeteria & Bake Shop or the Old Faithful Inn Bear Paw Deli. Ultimately, whether you decide to extend your visit so that you can wake up to steam blurring your room’s windows or prefer to make the show just a fragmented episode of a long trip, that’s up to you. Don’t fret too much if you’re unable to catch an eruption before you leave – it’s not going anywhere anytime soon. Lunch hours: 11 a.m.-4:30 p.m.
Bake shop hours: 6:30 a.m.-10 p.m. Lunch and dinner hours: 10:30 a.m.-7 p.m.